As part of its digital transformation, Ricoh has migrated its eDiscovery business to Microsoft Azure. The reasons: scalability, security and performance. For 80 years, Ricoh, the Japanese multinational that first saw light as Riken Sensitized Paper, has been known for manufacturing. But even with its long history, digital transformation hasn't passed Ricoh by. "While overall, we think of Ricoh as manufacturers for 80+ years, management of information has really been the focus of Ricoh for many years," says David Greetham, vice president of eDiscovery, sales and operations for Ricoh USA, the company's Malvern, Penn.-based North and South America arm. Specializing in cameras and office electronics, Ricoh has manufactured copiers for Pitney-Bowes and Toshiba, Fax machines for AT&T and Omnifax, even the 8-bit processor used in the original Nintendo Entertainment System (NES). Through the early 2000s, Ricoh grew to become the largest copier manufacturer in the world. It holds more than 46,000 patents for imaging and printing solutions, industrial products and digital cameras, and boasts 109,000 employees globally. But while manufacturing has been at its core, it has also expanded into businesses like software-as-a-service (SaaS) document management solutions (DocumentMail and RicohDocs) and document solutions (GlobalScan). And over the past 15 years, Ricoh USA has moved strongly into eDiscovery. Greetham says the company's focus is shifting from hardware manufacturing to digital services, and the ediscovery business is at the vanguard of that transformation. Ediscovery is the electronic part of legal discovery: identifying, collecting and producing electronically stored information in response to a request for production in a lawsuit, investigation or Freedom of Information request. It involves crawling through emails, documents, presentations, databases, voicemail, audio and video files, social media, web sites and more. And since electronic files are a lot more dynamic than hardcopy, metadata like timestamps are also an important consideration. When things were limited to paper, discovery could mean room upon room of boxes filled with documents that large teams of lawyers took weeks and months to process. In the digital world, the scale has grown exponentially. "We have a lot of data out there," Greetham says. "That spreads into litigation. Attorneys are having to review more and more data." In some cases, it's becoming impossible for humans to process the load in the timeframes required by the courts. That's where predictive analytics and machine learning come in. "With machine learning, there is a feature available called predictive coding," Greetham explains. "When attorneys review documents, they're making decisions about them: They might be not relevant, confidential, privileged, relevant. That's known as coding. Predictive coding will allow you to take a seed set, maybe you review 1,000 or 2,000 documents. The decisions that are made on those documents, we will apply those decisions to the rest of the documents. There has been some adoption of that because the courts are starting to accept that now. They're starting to accept that we have so much data that it might be, in some cases, unreasonable to expect an attorney to review everything." The predictive coding helps a much smaller team of attorneys get directly at the documents that are relevant to the case at hand. And the faster a legal team can access the data and use analytics to cut the review pile of documents down to a manageable size, Greetham says, the faster they can find the 'needle in the haystack' that their case might hinge upon. It should come as no surprise, then, that Ricoh's ediscovery business has been growing by 20 percent a year. But it isn't trying to manage that scale on-premises. "We made a decision about two years ago, in August of 2014," Greetham says. "We started moving all of our client-facing data into the cloud." Faced with massive and increasing volumes of data, and the need to keep it secure, Ricoh came to the conclusion that it needed to run that business from the public cloud. Based on enterprise experience, the ability to restrict data to particular geographic regions and FedRAMP certification — the U.S. federal government is the world's largest consumer of ediscovery services — Greetham says Ricoh decided to build its business on Microsoft Azure. "Encryption was a big issue for us," Greetham says. "Security, how many people we have to pay to monitor our systems to keep them secure — it became very clear to us that we needed to look at a public cloud environment. Azure has encryption at rest and encryption into applications. Having looked at cybersecurity and where hackers find weak points, it resonated with us as a committee. Also, part of the story is future technologies and how do we get into things like fully homomorphic encryption. What foundation can we have in place to be prepared for that?" 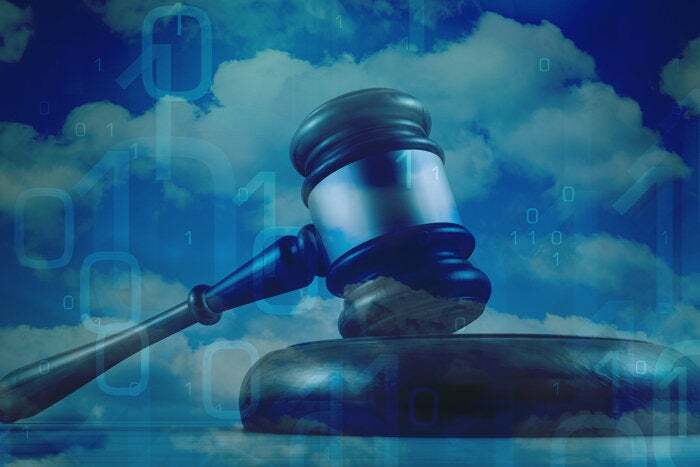 Clients can also specify which regions they want their data stored in, he says, which is a big deal for clients that have strict compliance restrictions around keeping data in a particular jurisdiction or country. Ricoh completed the migration to Azure in July 2015. "It actually went slightly faster than we expected," he says. "We're the first organization in our industry to do this. We know the early bird gets the worm but the second mouse gets the cheese, so we developed test environments, did sample uploads, got clients involved. We did it gradually, but we finished the migration two months ahead of schedule." Greetham says Ricoh can now provision terabytes of storage in minutes (rather than the weeks it used to take) and provide its customers with data security assurances through Azure's encryption process and security specialists. At the same time, it's decreased its hardware costs by more than 30 percent, while also increasing performance. "There's certainly a learning curve," he says. "But Microsoft worked with us as a business partner. Their experience in this environment was very good for us. We've found that our performance metrics have seen a 22 percent increase in the Azure environment. That's great for us and it's great for our customers. We've had no downtime, no clients complaining — in fact, we've had clients complimenting the improvement in our performance."